Post subject: Laying eggs help. Scarlet has been gravid for about three weeks now and started showing bumps in her stomach for about a week now. 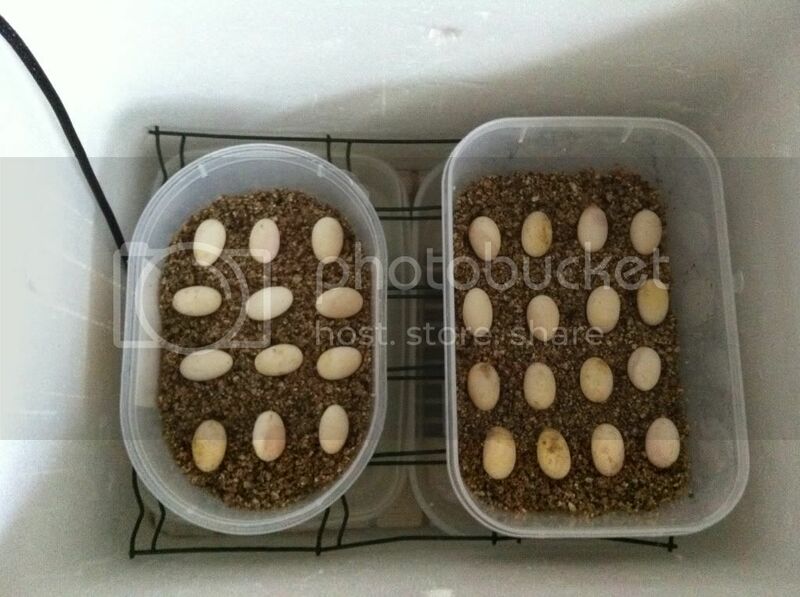 I have made a lay box as well as filling the viv with sand. She has been digging quite often and even keeps trying when she reaches the bottom. When I put her in the lay box she just goes to sleep. This is her first time. So my question is up to how long can it take a beardie to lay her egg and is there anything else I can do to encourage her to lay. Make sure the sand in the laying box is damp. I started off a tunnel for Fi to help her get the idea. Fi went mad for about 10 days before laying, trashing the viv scattering sand everywhere. She was dig, dig, digging all the time. A couple of days before laying she went right off her food - the eggs take up all the room in their stomachs. If she's still eating then she's probably not quite ready to lay yet. Hi everyone. Well its been ten days since I last posted and still no eggs yet. I have filled half the viv with damp sand and she just digs and digs. I have put her in they lay box several times and she does the same thing everytime. She goes to sleep. When should I start to worry if she still hasn't laid her eggs?? What temp is the laying box. The sand needs to be around 28C for her to be happy with it. By about 5 weeks I'd be worrying and getting an appointment with a specialist reptile vet as retaining eggs can be pretty bad for her. 28 in total which is really good for her first clutch. Im glad all went well look nice and pearly white as they should. Just a quick update. Most the eggs bar 3 are all good and getting big. Also looks like Scarlet is gravid again!! Will let u know on that one. Thats all for now apart from getting a couple of house snakes too in a ouple of weeks! Also im pretty sure a couple of the eggs have twins as the eggs are HUGE compared to the rest. Arc is 90% complete now. Just need the glass & runners and then to decorate them. Little hold back on the house snakes due to difficulty in transportation but ill have them by end of the month. Oh and yes Scarlet is definately gravid again. expecting those in about a week or two. Hope you're saving up for all those crickets! No need for crickets as I have a dubia roach colony. Be very careful as new hatchlings will find most sizes of roaches to large. We usually start ours on 3~5mm crix, so you'd need to be able to sort out baby roaches of about that size. Oh and Scarlet is laying her second batch right now!!! Will let you know how many when shes done and Ive uncovered them all. Ok she laid another 24 nice pearly white eggs!! !